This ambitious project saw Woodhead Heritage restore one of Lincoln’s oldest and most iconic landmarks. Newport Arch (and West Tower) is one of the best preserved Roman monuments in Britain and the only Roman gate-arch in the country still used by traffic. Adding a layer of stonework to the top to consolidate and protect the Roman brickwork. In addition, the cement-based mortar has been replaced with lime mortar and three sections of the gable wall have been taken down and rebuilt stone by stone. All repairs and renewals to the historic fabric were carried out using like for like materials and tried and tested ‘ancient monument’ techniques using traditional craft skills, and Woodhead’s own specialist heritage team, Woodhead Heritage. Renewal of fabric – The approach to the works was to be one of minimum intervention, sufficient to preserve the maximum amount of historic fabric. Due to the arch being in a state of disrepair it did mean that in instances the renewal of fabric had to be considered, renewal of fabric was only considered where the consequences of not renewing were likely to lead to more loss of fabric. Each element for renewal was considered individually and the only justification for renewal was if the fabric was no longer able to fulfil its intended function. Where works were carried out in areas that have been repaired in the recent past, the opportunity was taken to introduce even higher standards of conservation. This included replacing defective and poorly specified cement rich pointing in a more appropriate mix for the arches age. However, where areas of modern intervention were free of defects then these were left in situ. Consolidation and repair – The existing masonry was repaired and consolidated as far as reasonably necessary in order to conserve it and to protect surrounding fabric, using tried and tested methods. Modern materials (principally fixing resins) were exceptionally used but only in instances where there were absolutely no alternative and the result of not using them would be significant loss of fabric. Road Closure – The initial scope of works did not require the road closure as at the outset of the project the work to the face of the arch was minimal. After the scope of the work had been restructured, the risk was assessed and it was clear that there was no way to complete the works safely without closing the road. The Arch stands astride the entrance to Bailgate, and is in use by both traffic and pedestrians accessing the busy street which is home to a number of businesses. Due to high levels of usage access was restricted and opportunities to access the span of the main arch safely were almost insurmountable. The only way to gain safe access to the central arch would be with a scheduled full road closure. This lasted for a period of 4 weeks and was essential to allow the safe repair of Newport Arch, Lincoln’s treasured scheduled monument, and ensure the safety of the public and stonemasons alike. The closure enabled large sections of the gable walls to be taken down and rebuilt stone by stone by specialist local masons. Appropriate signs were put in place, not only to advise drivers of the diversion but to remind shoppers that businesses were open while the works took place to minimise the impact on the local community. This was planned in collaboration with the highways agency. The Bailgate Business Owners Guild – Representatives from Woodhead Heritage attended a local business forum, which acts as a support network for the businesses in the local area. Woodhead were able to explain in detail to the businesses about the works that were going to take place, and advise how the works were programmed to ensure minimal impact to the businesses in the immediate area of the site. This was done in collaboration with the City of Lincoln Council. 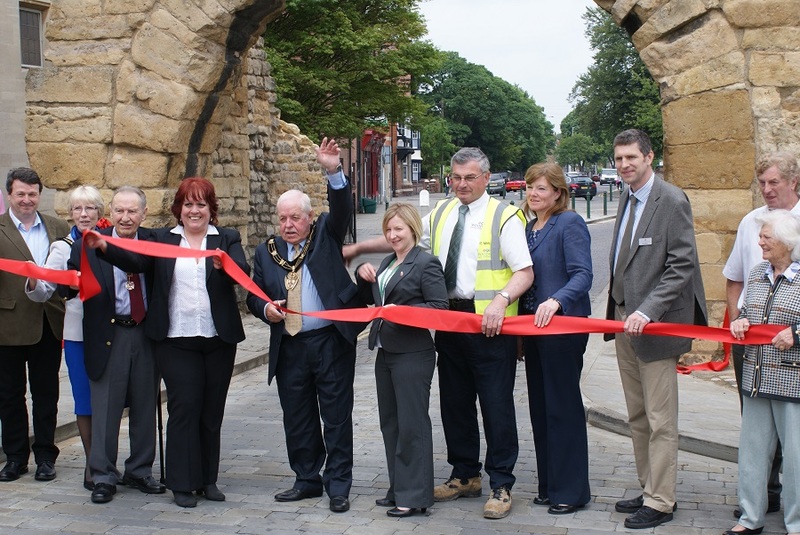 “The arch is the Roman north gateway to Lincoln and is an essential part of the rich heritage that makes us so successful as a tourist destination.